Visitor Mornings Just a friendly reminder that Visitor Mornings are on Wednesday and Thursday from 10:00 AM to 11:00 AM! November 22-24, 2017 Thanksgiving Break The school will be closed on Wednesday, November 22 through Friday, November 24. Elections Day The school will be closed on Tuesday, November 7. March 12th, 2017 Daylight Savings Just a friendly reminder to remember to set clocks forward one hour for Daylight Savings time on March 12th! February 14th, 2017 The students at CIA for Girls wish everyone a happy Valentines Day Happy Valentines Day! January 16th, 2017 Celebrating Martin Luther King Day! The children at CIA for Girls celebrated the legacy of Martin Luther King and learned values of compassion and tolerance. Check out their wonderful speech!! January 1st, 2017 Happy New Year Happy New Year to CIA for Girls community! December 25th, 2016 Happy Holidays! We wish everyone a peaceful and merry holiday season! Happy Thanksgiving Everyone! CIA for Girls wishes all our students and their families a wonderful Thanksgiving holiday! Enjoy an afternoon of fun!! Come sip refreshments, snack on small bites, and shop with others for beautiful jewelry. 15 % of all proceeds will be donated to CIA for Girls. 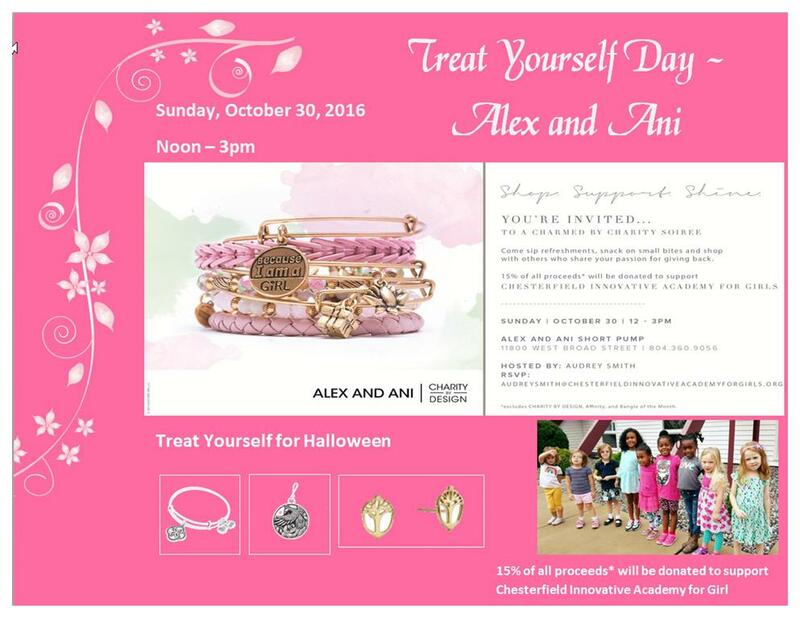 It will be located at Alex and Ani- 11800 West Broad Street. Thanks to Dianna! Thank you Dianna Waters, owner of Happy Pea, Inc for her donation of a raised plant bed, soil, herbs, and fall vegetables! September 6th, 2016 First Day of School CIA for Girls opened it's doors again for another exciting school year! Hurray for school! !